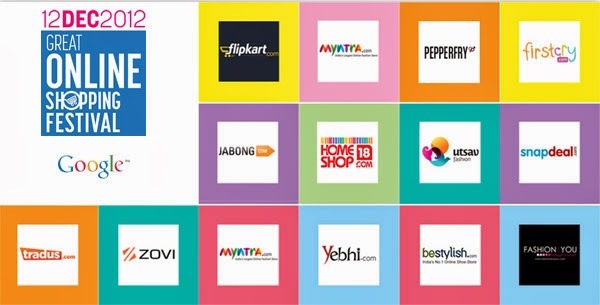 Great Online Shopping festival (GOSF) is giving a boost to sales on online retailers like Jabong, Myntra, Snapdeal, Flipkart and other online shopping website by huge discounts. GOSF is an online discount sales event that organized by Google which launched at last year. 240 websites took part in online shopping festival this year compared with 90 websites last year. The event was run for three days from 11 to 13 December. Because of higher than expected traffic, the site was not running for 12 hours on 11 December, so Google extended the event through 14 December. "At midnight on the 1th December, saw a huge traffic on the site.People waiting for the GOSF site to go live," said Nitin Bawankule, the director of e-commerce, Google India. Online retailers said that they saw sales increase by during GOSF, comparing to the rest of the year. In India 205 million internet users in Octomber and in December, reach 213 million by end of the year. Myntra's traffic grew about two times and revenue generated some 3.5 times over GOSF. Snapdeal, which is provide discount of 10-60%, is increase of 1 times in sales during GOSF.